Prompted by a recent discussion on the forum, and because it’s a recurring theme, I thought I’d go a bit (heh…) into how bit fields work. 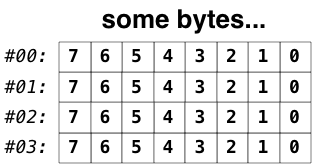 So how do you get the values back out, given just those 4 bytes (plus a header byte)? Obvious, right? On x86 machines, and also the ATmega, everything is stored in LE format, so that’s what I’ll focus on from now on (PIC and ARM are also LE, but MIPS is BE). Tomorrow, I’ll show a couple of ways to extract this bit field. That loose packing looks like a bit of a gotcha waiting to happen. Thanks for the heads up. I’m familiar with compilers trying to align data to speed things up, but the language I use most, Delphi (pascal++ if you like) has an explicit “packed” operator to force things up nice and tight, although having said that, it doesn’t actually have support for bit field definitions, so all you’re squashing up is word boundaries to byte boundaries! ~jcw, great writeup :) I was beginning to think everyone was dancing around with bytes according to some arcane intuited knowledge. heh. When I first glanced over the post I thought I saw some kind of padding going on. But then I had read it I needed to know all about this irregularity in packing on AVR. What would it serve anyway? I assume the skipping-to-byte-boundary might be done at compilation time by AVR-GCC? Is it some compiler flag perhaps? I’m using an Arduino (1.0.1 or something)+Makefile setup on Linux btw. Hmm, maybe avr-gcc isn’t packing the way I thought it did. I have to admit that I didn’t actually check the details on an 8-bit machine such as the ATmega. I’ll investigate, thx.